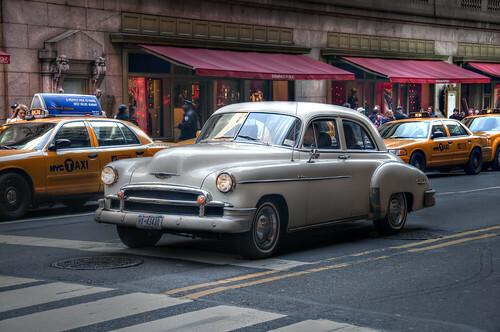 Oldtimer in Manhattan, originally uploaded by Werner Kunz (werkunz1). This is now my second car HDR shot. The nice thing on cars as object for HDR is that there are so many reflection. Unfortunately, I don’t know which car that is, but I maybe someone of you can help me? A great shot for sure Werner, and awesome blog! Excellent ! Looking at your HDRIs really makes me want to get Photomatix and give it a shot too. Wow is this HDR? Even so it doesn't matter. Great photograph of the car. The photo almost has a golden evening feel to it! Oh oops! It is HDR. haha. That looks a bit like a Chrysler maybe? That's what the logo looks like on the front at least.